Field Hockey BC is hosting a NCCP FUNdamentals Coaching Course on March 6th, 7th, 13th and 14th. This course is a great opportunity for new coaches or current coaches looking to refresh their skills in time for the upcoming spring season! For more information or to register for the course, click here. Field Hockey BC would like to extend our deepest condolences to the family and friends of Lorraine Logan, who passed away on January 23, 2018. In honour of her contributions to the field hockey community, we are taking this time to recognize and celebrate everything she did for our sport on a provincial, national and international scale. Lorraine, residing in Vancouver, first made her way onto the Western Sectional Team after a memorable performance in the second Western Sectional Tournament of the CWFHA at the University of Victoria in April, 1966. She was then selected to the 15 player Canadian National Team which was put together for a seven week international tour in the fall of 1967. This Canadian National squad travelled to Leverkusen, West Germany for the International Federation of Women’s Hockey Associations Conference from September 11-26. Their record of three wins and three losses in six tournament games was recorded as the Canadian women’s best result to date in international field hockey competition. They went on to play seven additional international exhibition games in the Netherlands, Northern Ireland and Scotland. The Canadians went undefeated on the back half of this tour, capturing six wins and a draw in their final three weeks of competition. 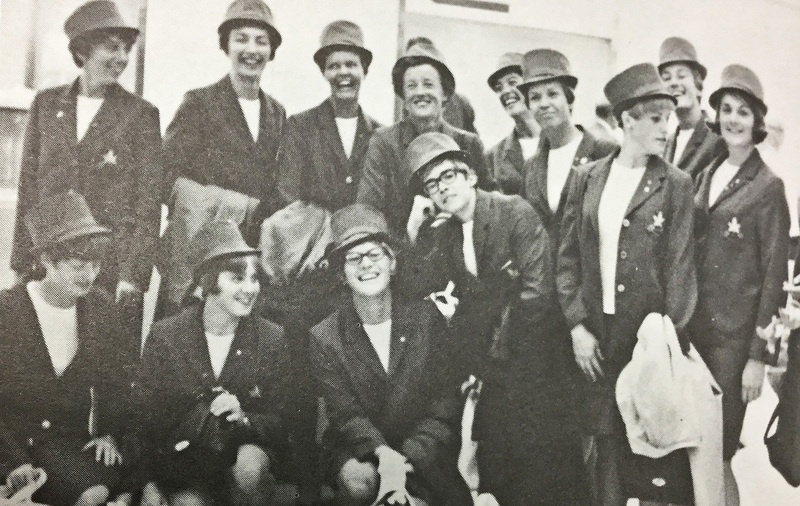 Lorraine (bottom row third from the left) and the Canadian National Team at the airport prior to departure for Germany (September 1967). As a full-back for the Canadian team, Lorraine was recognized for her relentless tackles on the defensive side and even stepped in as a back-up goaltender, carrying her team to a 3-2 victory in Scotland when netminder Joyce Harris was unavailable. After her time with the Canadian National Team, Lorraine remained active in the field hockey community as an International Umpire. In 1979, she was an umpire for the IWFHA World Championships held in Vancouver, BC. However, Lorraine’s legacy extends well beyond her international field hockey career. She is remembered by UBC Sports Hall of Famer and chairman of the first BC Women’s Field Hockey Federation meeting, Charlotte Warren, as a reliable and hard worker. “When I was the Circulation Manager of the [Canadian Field Hockey News]… and needed hands to collect the magazines from the printers, put address labels on them and take the 750 copies to the downtown post office, it was always Lorraine who stepped up to the plate… to help out,” Charlotte reflected. At Field Hockey BC, we consider ourselves very lucky to have had her as part of our community and we are truly grateful for everything she did for the sport. She will be deeply missed, but her legacy will not be forgotten. Reminder: Field Hockey BC’s 2018 AGM is This Weekend! Field Hockey BC would like to remind you that our Annual General Meeting for 2018 will be held this Saturday, February 17th at 12 p.m. The meeting will take place in the Pine Room at the Holiday Inn, Vancouver-Centre. To download all relevant meeting documents, please visit the documents page of our website. If you require any additional information, please do not hesitate to contact us by e-mail at info@fieldhockeybc.com or by phone at 604-737-3046. We look forward to seeing you at the AGM this weekend! Registration is now open for the 2018 India Club Tournament! This year’s event will take place June 22-25 at Tamanawis Park in Surrey, BC. Download the 2018 India Club Tournament Info page for full event and registration details! Field Hockey BC is pleased to announce the hiring of Julie King who will be bringing her extensive coaching knowledge to us as the new Provincial Coach and Performance Manager. To learn more about Julie King, you can read her bio on our Meet the Coaches page. Mark your calendars for a Regional Umpire Course being offered in Vancouver on January 15th & 17th. Provincial Umpires aspiring to upgrade their rating should sign up! For more information and to register, visit the Umpire Education page. Cowichan FHA is hosting the U18 Girls Indoor Tournament at the Island Savings Centre in Duncan from January 26-28. Check the U18 Indoor Tournament Info Guide for important dates and the U18 Team Registration Form to sign up!